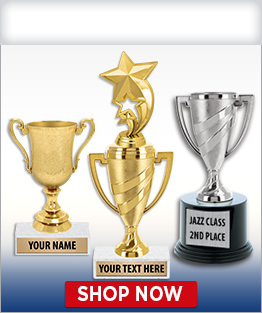 Crown Awards is America's largest awards manufacturer, and with over 40 years experience as the industry leader, we have it all--from corporate cup trophies to basketball cup trophies to baseball cup trophies. 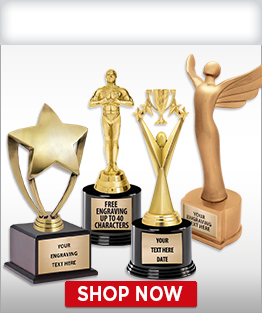 Simply select the trophy you like and personalize with your very own engraving. Crown offers SAME DAY SHIPPING (on web orders placed by 5:00 PM EST) on in-stock cup trophies and FREE SHIPPING on all cup trophy orders $100+! Sports Animal Cup Trophies Archery Cup Trophies Auto Cup Trophies Ballet Cup Trophies Baseball Cup Trophies Basketball Cup Trophies Bowling Cup Trophies Boy Scouts Boxing Cup Trophies Cheerleading Cup Trophies Chili Cup Trophies Cricket Cup Trophies Corporate Trophies Dance Cup Trophies Drama Cup Trophies Eagle Cup Trophies Engraving Plates Fantasy Football Trophies Fencing Cup Trophies Field Hockey Cup Trophies Fishing Cup Trophies Football Cup Trophies Funny Cup Trophies Golf Cup Trophies Gymnastics Cup Trophies Hockey Cup Trophies Honor Roll Cup Trophies Horse Cup Trophies Karate Cup Trophies Mascot Cup Trophies Martial Arts Cup Trophies Music Cup Trophies Pinewood Derby Cup Trophies Ping Pong Cup Trophies Pop Warner Cheerleading Cup Trophies Pop Warner Football Cup Trophies Racing Cup Trophies Reading Cup Trophies Recognition Awards Religious Cup Trophies Rowing Cup Trophies Running Cup Trophies Scholastic Cup Trophies Science Cup Trophies Soccer Cup Trophies Softball Cup Trophies Swimming Cup Trophies T-Ball Cup Trophies Tennis Cup Trophies Torch Cups Trophies Triathlon Cup Trophies Twirling Cup Trophies Volleyball Cup Trophies Wrestling Cup Trophies 5K Cup Trophies See More Sports! 3 Beautiful Base Finishes Available! Holds 4 Small Plates On Each Side! 9 1/4" And 10 3/4"
Available In 8 1/2" And 10" Sizes! 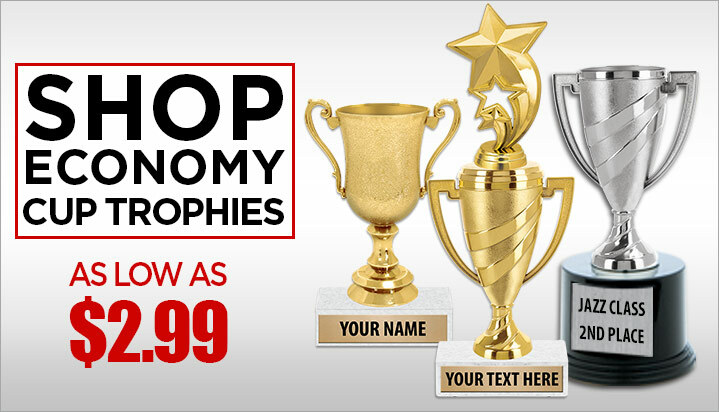 We have the largest selection of cup trophies available anywhere. Our engraved loving cups are created with a high-quality laser engraving process. 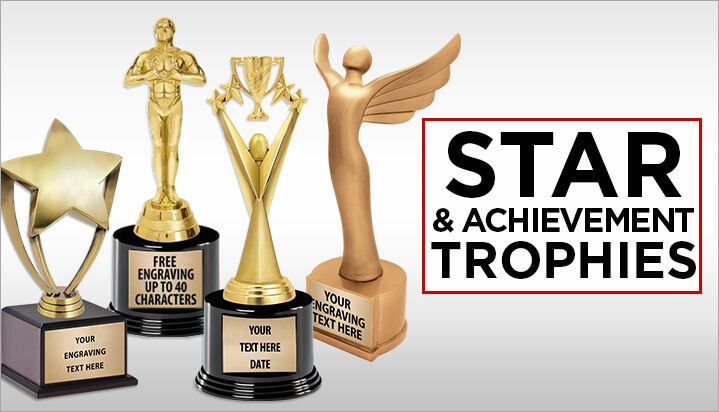 Customize the award with your text. 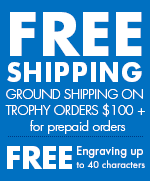 We include FREE engraving up to 40 characters and FREE ground shipping on trophy orders over $100. So whether you're looking for a participation cup trophy or a championship trophy cup, Crown has what you need. Whether you are awarding participation or crowning a champion, Crown's sport cup trophies are the perfect answer. 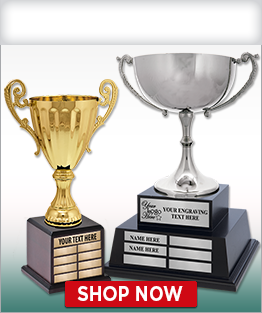 Crown offers cup trophies for a number of sports and activities, and in a variety of styles. 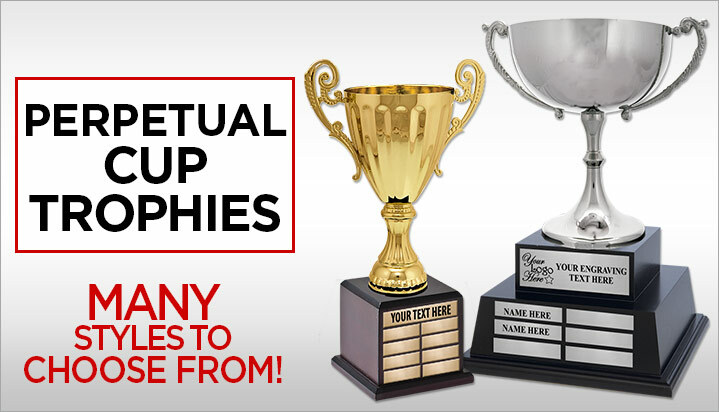 As America's largest awards manufacturer with over 40 years experience, Crown's cup trophies will fit your loving cup gift-giving needs whether your budget is large or small. We provide our customers with superior customer service and the highest quality products at the lowest prices available, making us your trophy cup awards manufacturer of choice. Our staff is here Monday through Saturday to answer any questions you may have regarding your cup trophy order. Call us today at 1-800-227-1557!